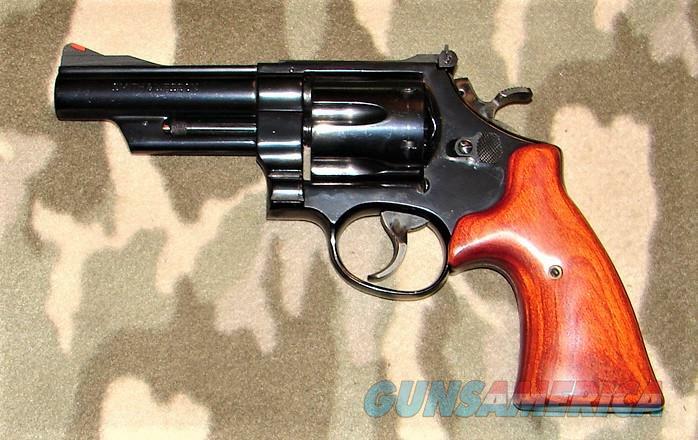 Description: Smith & Wesson Model 57 Revolver serial #N453031, 41 Magnum, 4" pinned heavy barrel with an excellent bore. This beautiful "57" retains about 99% factory blue with minor high edge wear and light turn ring on the recessed cylinder. The .500" target trigger and .500" target hammer have beautiful case-hardened colors with few light operational marks. The unmarked aftermarket smooth laminated hardwood grips rate excellent. The revolver features a factory white outline micro adjustable rear sight and red ramp front sight. This revolver has only seen light use and includes a pair of H.K.S. #57 speed loaders. There is no box or papers.